It’s a beautiful day this morning in Central Florida, the sky is a mass of blue and cotton puff clouds, a perfect morning for coffee and my favorite pancakes on the back patio… the type of pancakes that make you smile and think of Caramel Apples from a local festival. Honestly, they really are a sin to eat they’re so dangerously delicious, combining thick rich Caramel, crisp Apples, tasty Georgia Pecans with homemade apple pancakes.Mmm, It’s going to be a lovely and delicious morning! The back patio is the place I go when I want to think and be one with nature, it’s gorgeous out there nothing but old trees, plants, and grassy land. That’s one thing I don’t miss about South Florida… I enjoy my peace and tranquility these days…Alone time has become a necessity in my life, it feels good to let my worries run off my shoulders this breezy morning enjoying my favorite breakfast treat. I love making these sinful pancakes on mornings I want something special, it’s my way of making it a special morning to savor and enjoy. The Caramel Apple Pecan Pancakes ingredient list is a simple one, all ingredients you can locate at your local farmers market and/or favorite grocery store, most you may already have stocked in your pantry now. Mix together flour, sugar, baking powder, and salt in large mixing bowl. Mix together buttermilk, eggs, and vanilla in a separate mixing bowl. Add wet ingredients to dry ingredients, stirring until combined. Melt butter and add it to the batter, stirring gently to combine. Stir in more buttermilk if needed for thinning of batter. Cook on a well-oiled skillet over medium-low heat until pancakes are golden brown. Place 1 pancake on the serving dish, layer a light layer of gala apples, place another pancake down on top of apples, repeat layer of apples, place another pancake on top, drizzle caramel sauce over pancakes, top with pecans, and garnish with apples. © Heidy L. McCallum and The McCallum’s Shamrock Patch, 2014. Unauthorized use and/or duplication of this material or photos without express and written permission from this blog’s author and/or owner is strictly prohibited. Excerpts and links may be used, provided that full and clear credit is given to Heidy L. McCallum and The McCallum’s Shamrock Patch with appropriate and specific direction to the original content. You may not copy and paste recipes to share on Social Platforms. These pancakes would be a great way to wake up in the morning. The Hubby would love them! Pinned! “Caramel Apple Pecan Pancakes” are a great treat for the hubby this weekend!! Let me know how you liked them Nicole! I’m in the my fall Apple faze right now. I love the Caramel Apple Pecan Pancakes. So perfect for fall especially when making breakfast for dinner which we did tonight. Can’t wait to try the caramel with apple. Thank you Joanne, glad to see you drop by!! I would these pancakes for breakfast. They look delicious. These pancakes look AMAZING!!!!! I love caramel!!!! These look amazing! Thanks so much for sharing with Foodie Friends Friday. I’m sharing on my Walking on Sunshine FB page now! Yummy! Thanks for having me! Loved your party!! I do love these delicious Caramel Apple Pecan Pancakes. Thanks so much for sharing with Foodie Friends Friday. Pinning/sharing. Heidy, will you bring some for breakfast. There isn’t much in this world that sounds more delicious than Caramel Apple Pecan Pancakes. Nothing…. drooling. I feel like I can smell the caramel all the way from here. Beautiful photo! Just in time for the weekend when I eat a filling breakfast! apple and pecans are a great combination and hello, caramel? Heaven! Oh you’re going to love this then!!! It’s VERY filling!!! 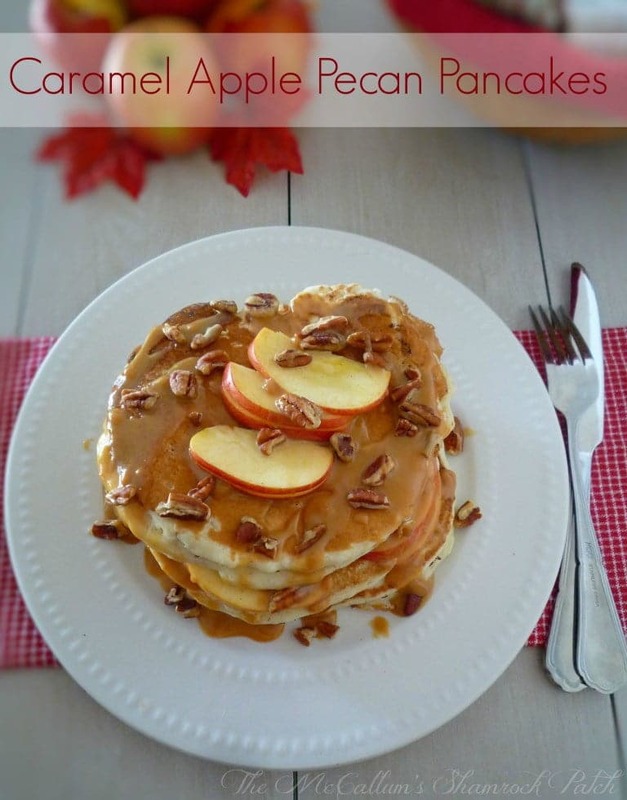 Caramel Apple Pecan Pancakes sound like such a wonderful Fall morning treat!!!! These pancakes is the best way to start your day! Filled with energy! “Caramel Apple Pecan Pancakes” are wonderful for starting the morning! Glad you enjoyed the recipe ! These look amazing! If you’re making them this weekend, I’ll be there!!! Thank you for sharing at the #HomeMattersParty 🙂 Hope to see you again next week. Those Caramel Apple Pancakes are amazing! You should try them!